The Harp was much in evidence as a part of a musical tradition which flourished in the rural south in the 1920`s and 30`s - the jug band. These bands, which played on street corners, in saloons and at country suppers, usually used banjo, guitar, washboard, kazoo, sometimes fiddle, jugs and harp. But most often the harp was used in these bands for melodic-rhythmic support, with much of the playing being done in the upper register so that the sound would carry over the booming jugs and thumping rhythm backing. Another influential blues harp player was Sonny Terry, born Saunders Tedell near Durham, North Carolina in 1911. Sonny was probably the first person to record early country or folk styled harp. His father, a farmer, taught Sonny the basics of the Harp playing. At a young age Sonny was left almost totally blind in 2 separate accidents and on leaving home at 16, he went to play on street corners to make a living. In 1934 he met guitarist Blind Boy Fuller, who was making a living in the same way. They teamed up and travelled together and recorded a few sessions in New York 1937 and in South Carolina in 1938. 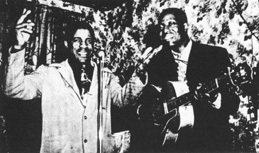 Fuller died of kidney ailment in 1940 and so Sonny teamed up with Brownie McGhee. Musically Sonny ran the whole gamut - from folk beginnings to folk- orientated recordings with Leadbelly and Woody Guthrie, from early commercial blues sides with Fuller to R & B sides with Brownie in the 40`s and 50`s - from street corners in the South to concert stages across the world. Sonny Terry`s Complete recordings 1938-1945 In Chronological Order is available on DOCD-5230. Another highly influential blues singer-harpist was the Chicago based Sonny Boy Williamson 1. (seen in the picture to the left accompanied by Big Bill Broonzy on guitar). Although he was born (1921) near Jackson, Tennessee, his style was more in the city blues vein than the country and after leaving home, in late 1920`s and early thirties he hoboed and worked with the bluesmen Big Joe Williams, Yank Rachell and John Estes through Tennessee and Arkansas. The Harp was the instrument of choice for this itinerent lifestyle. Small, easily carried in a pocket or bindle and it was cheap. Originally intended as much as a child`s toy as a serious instrument it had special attractions for the poor and the itinerant. In the rural southern states of the U.S.A., on sharecroppers` stoops and in the hobo lifestyle, it developed, almost in isolation, into a genuine folk instrument. In the late 30`s Sonny Boy began to record as a featured artist, fronting his own band - which usually consisted of piano, guitar, bass and drums. These recordings laid the groundwork for the Chicago style of R& B that dominated the blues scene in the late 40`s and early 50`s. Sonny Boy used country or folk based material, but urbanised it in arrangements more palatable to the Afro-American in the industrialised North. This type of `arranged` country blues, with a heavy beat added was his main contribution. His style of `choked` Harp that broke into a half-moan, half-scream was tremendously popular and influential. Tragically his life was cut short, when upon leaving the Plantation Club in Chicago after playing a gig, Sonny Boy was mugged and beaten. He died of a fractured skull and other injuries on June 1st, 1948 and was buried in his home town of Jackson, Tennessee. Sonny Boy Williamson Complete Recorded Works In Chronological Order Volume 1 is available on Document DOCD-5055. This article was cobbled together from various sources but thanks are mainly due to Tony "Little Son" Glover (An Instruction Method for Playing the Blues Harmonica) and Pat Missin who has a cracking little website regarding all things to do with the Harp.